It's countdown time! 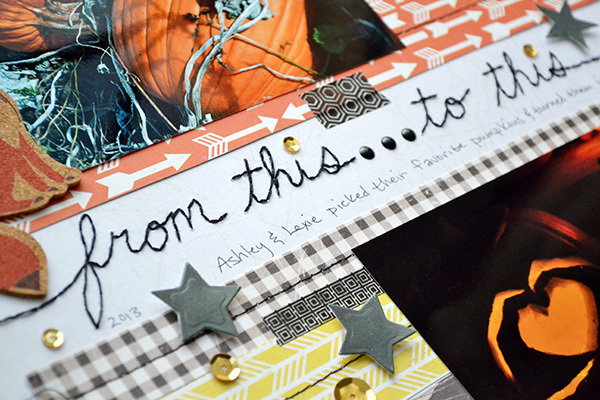 Only five more days until Halloween, so this week I'm sharing some unique ideas for scrapbooking your spooky celebrations and traditions on the We R Memory Keepers blog. 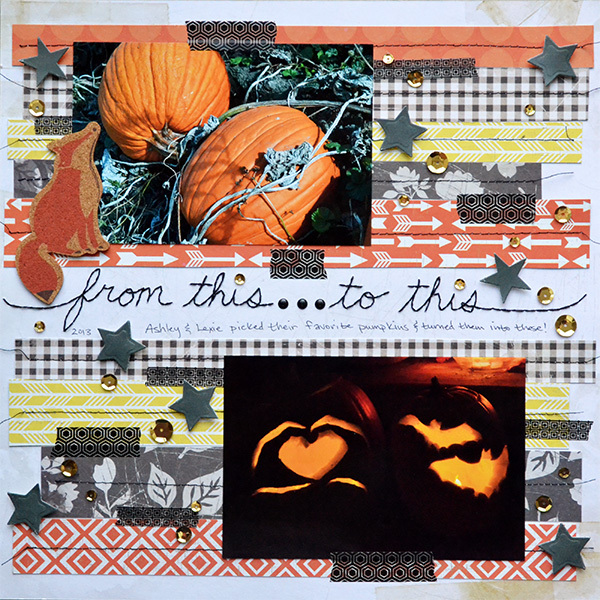 First off is a fun layout about one of our family's favorite traditions--pumpkins. And here is your Halloween scrapbooking tip #1: document the Halloween transformations you see around you. I'm a sucker for transformation pages. I love to see the "before" and "after"--very cool! So on this page I decided to place a photo of the pumpkins my daughters chose at the pumpkin patch while still on the vine next to a photo of their fully carved and lit jack-o-lanterns sitting out on our front porch. Full instructions and supplies for this layout are found on the We R blog HERE. I created my hand stitched title by first writing it in pencil lightly on the paper. Then I took my Sew Easy Needle and poked stitching holes following my writing with my Sew Easy Mat underneath the paper. Then I back-stitched the title with my needle and black Sew Easy Floss, adding some Enamel Shapes and sequins to dress up the title a bit. I finished off my page by adding some additional layers, texture and depth with machine stitching, washi tape, die cut stars, and sequins. There are many more Halloween transformations you could document--your home before and after decorating it, making a costume, doing Halloween makeup, making Halloween goodies or party favors, your child/grandchild filling his bucket with trick-or-treat candy, etc. 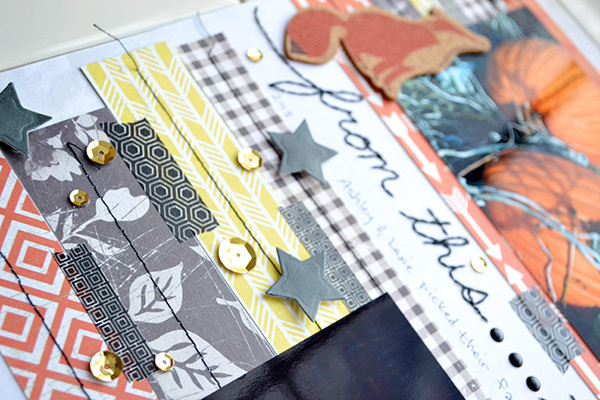 Which transformation could you scrapbook this week? What an awesome page!! Love the before and after photos and LOVE the stitching!! Awesome layout love the way you did the before and after. So COOL!